I don't know about you, but I love seeing other crafters' work spaces! I'm always looking for good organizing ideas and tips and maybe I'm a little nosy, too! Anyway, I thought I'd share some photos of mine. I have done a minor clean up but I find that it's really an ongoing process and I'm constantly making little changes and I figured I'll never actually be DONE. Here's the view from the door. IKEA desk and bookshelves. Pottery Barn Kids 'nooks' on top of the short bookshelves. Cheap Staples chair. To the right, the door of the closet is off its hinges and has some of my punches hanging on it in a clear shoe hanger. View from the closet. More IKEA products (2 sets of drawers, stacked in the far corner) and just the edge of a 'workstation desk' visible. In the right hand bookshelf, you can see my Copics and my Stickles (hanging upside down by velcro dots) as well as my unmounted stamp storage on the shelf at the right hand side. My most-used inks. Mostly Stampin' Up, but some Memento and Hero Arts as well. My 'less-used' inks are in a box on the bottom shelf of this same bookshelf. 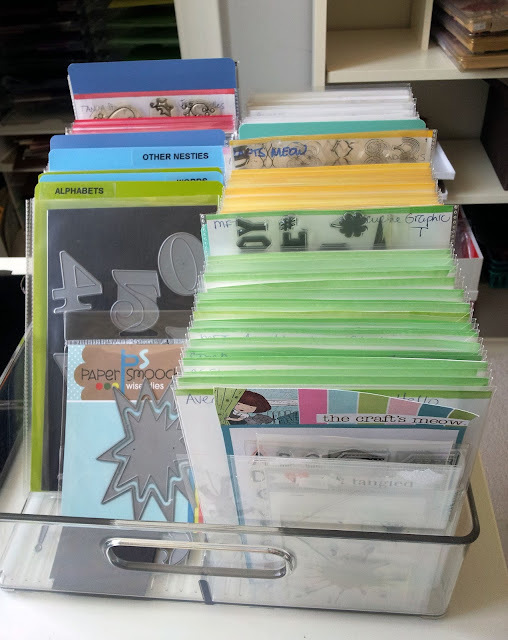 You can see some of my DVD Stampin' Up unmounted stamps and some of my CD cases of clear stamps. Ah, clear stamps and their storage - it's my constant challenge. Some are in CD cases (mostly alphabets). This is my container with my favourite Happy Birthday sentiments. When I'm making a birthday card, I pull this out and see which one works best (as well as checking my wooden stamps - see below). Or if I need a pumpkin (or an animal, or a shape), I can see them all in one place and choose the best one. It saves me flipping through every set I own, every time. But it means I often don't remember who the manufacturer is. So I started this system, as demonstrated by Jennifer McGuire. These are my newer sets, stored in Avery Elle storage pockets, with a piece of Michael's white cardstock inside. I colour code them (with a stripe of Copic colour) - green is sentiments, yellow is backgrounds/elements, pink is floral, plain is other, red is Christmas. On the left side of the bin, I have all my dies also in pockets, on magnet sheets. I'm loving this for the dies, but I do feel like I'm flipping through all my clear sets all the time to see if I can find a suitable sentiment. Not 100% sold on this system, although it does allow me to give credit where credit is due! Here's a better view of the workstation desk. On the upper shelf, and under the drawers (and in the spot where one would sit if they were sitting at this desk), I have stacks of drawers that keep things like tools, small punches, glitter, bling, ribbon scraps and supplies. Having this workstation leaves me a nice big clear space so I can leave my Cuttlebug out (the drawer under the Cuttlebug has all my plates and embossing pads, as well as sandwich instructions). See below for what's in the left hand drawer. Can you see my circle nestabilities hanging from 3M hooks on the side of the IKEA drawers? I got sick of taking them out of their storage every single day to use them. The boxes behind the Cuttlebug have finished and almost-finished cards in them. To the left of the workstation is the edge of the monstrosity of a ribbon-keeper I bought in my 'have to own everything' stage. Fortunately, it's behind the door, so I can forget about it most of the time. 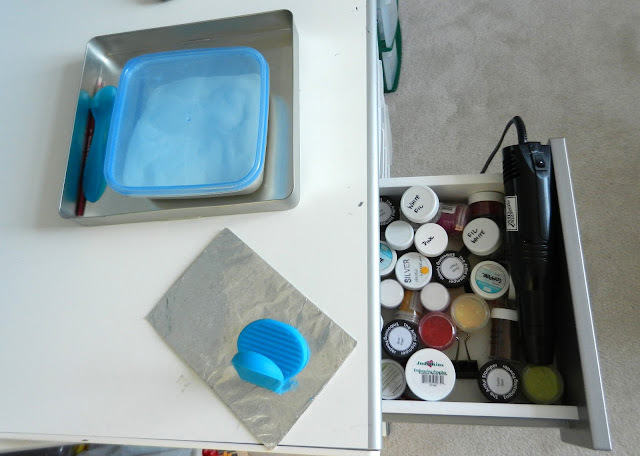 The left hand drawer of the workstation has all my embossing powders, my heat gun, my silicone 'grabber' and my foil 'reflector'. I put the piece of cardstock I'm embossing against this foil-wrapped piece of chipboard to help reduce warping and burning. On top of the IKEA drawers is more ink storage - my Kaliedecolor and distress inks are here (and my Walkman and speakers). Inside the IKEA drawers, I use shallow bins to help keep my wooden stamps organized. They are organized by theme, for the reason above. It will horrify some of you to know that I do not keep my Stampin' Up stamps in sets. The ones I want to keep, I write the name of the set on the side, and I sell the rest in my LSS's semi-annual garage sale. BTW - wooden stamps are my favourite (except for those very small ones, then I prefer clear). 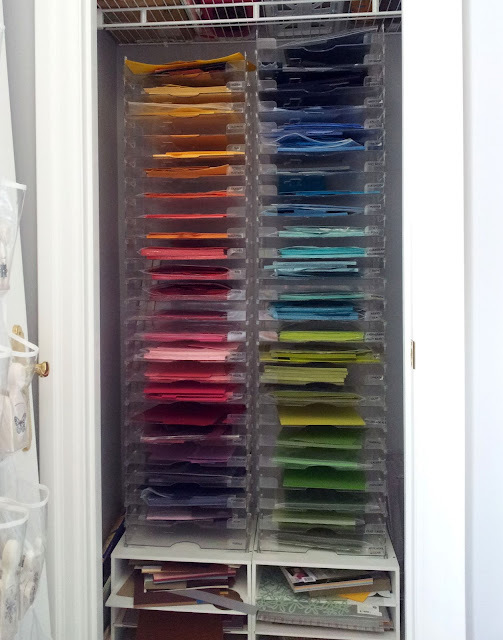 Finally, in the closet is my coloured paper storage. I was able to buy these used 12x12 clear stacking racks from my LSS at a great deal and I keep each colour in a 9x12 'ziploc' type bag - full sheets and scraps. It takes up a lot of space, but it's definitely easy to find a colour when I need it! At the bottom is my mess of glitter, shimmer and patterned papers. To the very left, you can see the door with the punches hanging on it. I think I've hit all the highlights - and more! I hope you've enjoyed this little 'tour'! Feel free to ask any questions or contribute any helpful tips! Visiting your your craft room when I was there was one of the highlights our big day out! WOW, Ardyth! I am so green with envy! I can't wait until I actually have a room to myself, with a real desk! I feel like Michelle... green! This is awesome Ardyth, white and airy! (also love the new wider bigger layout of MAskerade!) Fabulous! Fantastic organization! Love the way you organize your stamps, I do the same thing. And the big window is awesome!!! Oh I am sooooooo jealous Ardyth! My craft 'space' consists of a bench top, a cupboard and a chest of drawers...I'll be showing this to the bloke just to give him a major hint! And the amount of stamps you have....no wonder your cards are so amazing...looks like you have an entire shop to choose from! So clean and tidy and organised ... hope I can work my way to this! I absolutely love seeing your craft space! Awesome! Ardyth, what a wonderful place to work! LOVE your white shelves and drawers. So crisp looking, and everything is easy to find. You're right, though, about organizing never being finished. New stuff always throws off the balance and requires a bit of rearranging. Thanks for this tour, Ardyth. Your room looks very inviting and I have picked up some great ideas. I feel like an ikea trip might be imminent. Loved this toor! Your room is so organised and spacy... (mine is 2x3m)And that window and on the northside is (allmost?) perfect! Ooh, this is so timely! I'd just spent an hour browsing and pinning on Pinterest craft room storage ideas, then saw your post. 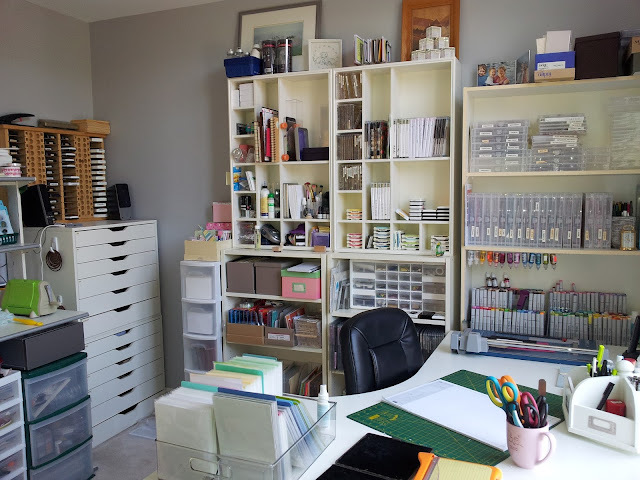 Your ginormous, spacious craft room is fabulous and it's given me lots of ideas for my new craft "room" (I use the word loosely - a real estate agent could only describe mine as "bijou"!). I'll post some pics when DH has finished DIYing and I can get in there! Ardyth - your crafting room is just fab. I love the big arched window and all those lovely white units containing your stash. I do like the paper shelves - so pretty. Thanks so much for sharing. I think you are very well organized. To me, organization means to be able to lay your hands on what you want, when you want it. It has nothing to do with lack of messiness. Everyone works in a different way, and need their supplies in different places. I love that your space is light and bright. It obviously is an inspiring spot for you to work. you have an awesome craft room!!! Don't feel bad about breaking up stamp sets. This is actually a great idea. I have many stamp sets that I buy and never use some of them. I use clear stamps and this poses more of a problem of breaking up sets, but I'm sure someone could use the ones that I don't. It's a shame that some one them never feel ink. Great tour! Thank you for sharing it with us! I wish I could have a room like yours! So much storage space! Unfortunately though I am bed bound so even if we had a spare room I wouldn't be able to manage in there as I have to do everything from my bed but I can dream! Hopefully one day I will be well enough and live in a big enough house to have one! Thanks for sharing - I love peeking at crafty spaces. Love the vertical storage and that glorious window! Wow! What a fab work space! So bright and tidy and super organised. LOVE your light airy room Ardyth, it looks so organized and 'user' friendly! I am definitely going to try a foil reflector and now I have to go and google what a 'silicone' grabber is too lol. Thanks so much for sharing. I never will show you my room, because its just a big mess....Love your room, thanks for sharing! Wow...what an amazing room. I can see why your cards are always just stunning, thank you so much for sharing. That was an awesome tour, Ardy, thank you so much for taking the time to do that! I LOVE how neat and organized you are and that there are so many similarities to our styles, especially that we store our stamps by theme. When I started, I never knew from blogs, so who cared who made them, including Stampin' Up. I even have trouble remembering what I have by theme, let alone if they were by set! But it's a very personal thing and I know the other way works best for others. I am in awe of your space, Ardyth! Such a beautiful window and your organization is incredible! I need to try this foil embossing thingy! I'm so frustrated with the warping. What a dream room! When I dream of a having my own craft space, this would be it. You are incredibly fortunate. I craft on my dining room table. I loved viewing your craft room. I especially like those Ikea drawers you have in the corner. As well, the way you store your stamps..eg the birthday...great idea!! I love all the light you have in your craft room and your organization ideas are great, Ardyth! Thanks for the tip about using foil on chipboard for embossing...Genius idea! Thanks so much for sharing your wonderful craft room. I love my white ikea drawers as well, they are just perfect for storing. Enjoyed the tour very much! Thank you! Wow what a wonderful brilliant space. Nice organized and roomy too! Not obsessive...there's room for more. Thanks for sharing your crafty space. Fabulous room. I wish I had that much light. I am speechless at your incredible room. What an amazing place to create. Awesome! I love seeing other people's crafty space!! That huge window is amazing - I want one like that in my room! I like your system of storing like stamps together. I too get fed up of going through every set set to find just the right Happy Birthday sentiment! As for questions.. could you tell me a bit more about your embossing process? I'm curious about the foil-wrapped chipboard and that cool little silicone grabber. I am so jealous of your space! I am lucky to have the spare room, but it doubles up as the guest bedroom so have to keep my stuff fairly compact. Oh my goodness gracious me sakes alive (huh?) No wonder you create such amazing cards! Heck, just stepping one foot into this room would inspire even my DH. The natural light has me swooning! AND your perfectly organized 'schtuff'. So much room for the creative energy to flow! Thanks so much for sharing these pics and your storage solutions. I have picked up several tips that I would like to implement over the winter! I would also love to know about the silicone grabber and the foil reflector ??? You are seriously organized, a girl after my own heart! Everything is so neat and tidy, it looks like a fabulous place to create. No wonder you have so many awesome ideas, no clutter to make your mind wander! TFS! Wow, I can't imagine my craft room ever looking this tidy! I wish I had the perfect answer for you about stamp storage, but we all have the same struggle. 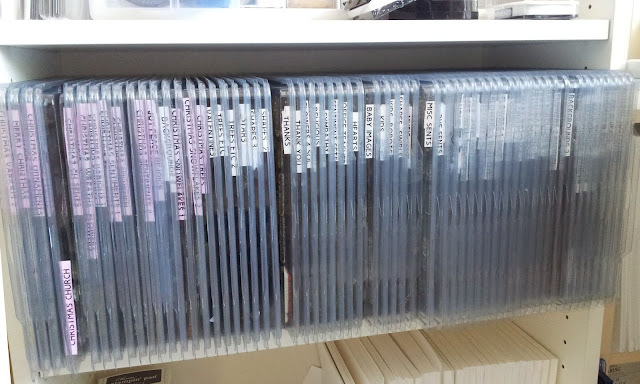 Though I'm not crazy about SU cling mount, I do love how they have little pictures on the spines of their DVD cases so you can see at a glance what's inside. That's exacltly why I stuck all of my dies to giant magnetic boards on the wall, so I can see them all when trying to find something just the right size or shape. Like you, I also have a separate work station so I can have my Cuttlebug out at all times. Without that desk, it would just sit on the floor all time time because I can not put it away! Wish I had the gorgeous window you have. Mine is much less dramatic! I really enjoyed seeing your craft room. All that white was just lovely. I was also interested in your stamp storage. It is a problem we all grapple with, and the issue of knowing what one has. To this end, I am currently making up a paper catalogue. I am stamping up ALL my stamps (gulp!) on heavyweight, very smooth paper and putting them into plastic sleeves in a folder. They are organised thematically. Initially I did this for insurance purposes but actually it will make a fantastic resource when I am stamping. It has taken me several weeks already but will be worth it when it is done. Ardyth, your craft space is so well organized. I was recently inspired by Jennifer McGuire and the Avery Elle pocket storage system. I'm loving it. Such a wonderful space! Love your organization!! And I think we all struggle with the stamp storage issue and having to use time to locate what we want to stamp with! Sheesh. Yeah, color me green too. What a lovely and bright room. I agree it is (in my case would be) clever to store stamps by theme. And I dream of a magnetic wall to store dies. TFS. I have definate room envy! Especially with your lovely big window and all that space to fill. Do you happen to know what the name of the ikea draws are - would love to see if we have them in the UK. 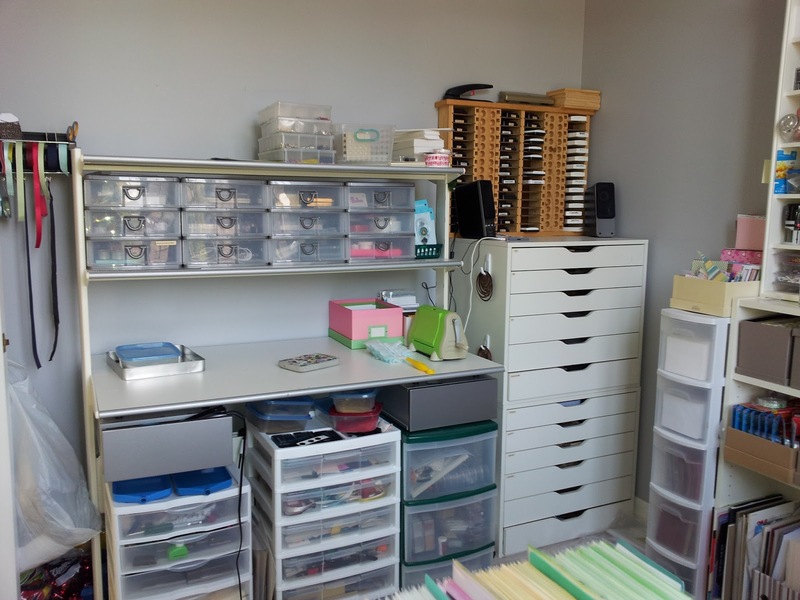 Love your craft room ...thank you for sharing! I am dying to know where you got your clear stamp storage bin..the one with color coated stamps in it. Is it a refrigerator bin? Such a well organized room. Beautiful Ardyth ! I love your space Ardyth. I love that it is so bright. I know what you mean about it never used to matter if you knew the name of the stamp because it didn't matter. Now I feel the need to label everything! Thanks so much for sharing with us! Thank You for sharing the valuable information.Its very helpful to me.